You’ve installed Babel, but you haven’t “plugged it in” to your React app yet. You need to set up a system in which your React app will automatically run through Babel and compile your JSX, before reaching the browser. There are a lot of different software packages that can make this happen. The most popular as of this writing is a program called webpack. webpack is a module that can be installed with npm, just like react and react-dom. You’ll also be installing two webpack-related modules named webpack-dev-server and html-webpack-plugin, respectively. We’ll explain these a little more soon. 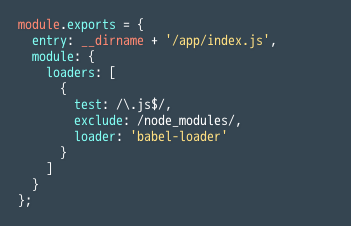 webpack should be saved in development mode, just like babel. Alright! Webpack has been installed! Webpack’s job is to run your React code through various transformations. Webpack needs to know exactly what transformations it should use! You can set that information by making a special webpack configuration file. This file must be located in the outermost layer of your root directory, and must be named webpack.config.js. It is where you will put all of the details required to make webpack operate. In your root directory, create a new file named webpack.config.js. Which transformations it should use on that file. Where the new, transformed file should go. Let’s walk through those three steps! All of webpack’s configuration will go inside of that object literal!. The first thing that webpack needs to know is an entry point. The entry point is the file that Webpack will transform. In this example, webpack will transform the result of <App />. If <App />‘s render function contains components from other files, then those components will be transformed as well. If you make your entry point the outermost component class of your app, then webpack will transform your entire app! To specify an entry point, give module.exports a property named entry. entry‘s value can be a filepath, or an array of filepaths if you would like to have more than one entry point. For this project, you will only need one. 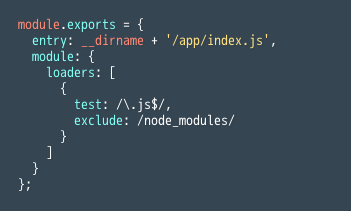 In Node.js, __dirname refers to the currently executing file. 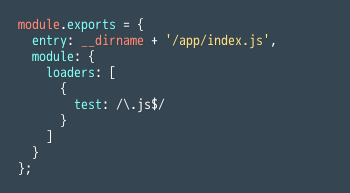 __dirname + /app/index.js will create a filepath pointing to the currently executing file, down into a folder named app, and landing on a file named index.js. What Transformations Should Webpack Perform? Webpack can now successfully grab your outermost component class file, and therefore grab your entire React app. Now that webpack can grab all of this code, you need to explain what webpack should do with it once it’s been grabbed. Each “loader” that you add to the loaders array will represent a transformation that your code will go through before reaching the browser. The regular expression /\.js$/ represents all strings that end with the pattern, “.js”. That means that this loader will perform a transformation on all “.js” files. In this example, you have a loader with three properties: test, exclude, and loader. 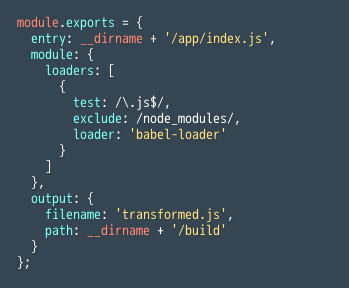 Your loader will search for all files ending in “.js”, excluding files in the node_modules folder. Whatever files it finds, it will run through the ‘babel-loader’ transformation. Where does the string 'babel-loader' come from? 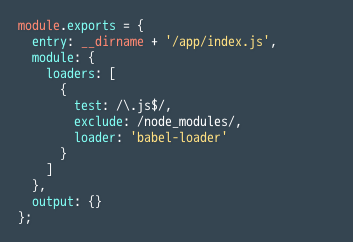 When you ran the command npm install --save-dev babel-core babel-loader babel-preset-react, you installed babel-loader into your node_modules folder. Your loader property will automatically be able to find it there. The magic of npm! Whenever you’re ready, continue to our next article!